I expect a lot more assists. The team should be built around him ! Going to be the best player in the league this season. He is a mighty big fecker. Hoping for a scintillating season for him! He will dominate the league this year. Him and Lukaku could be a potent combination. There's no doubt he's one of the most creative players in the world. Looking forward to him getting more assists. Well, he's our best outfield player and will have a lot more responsibility this season now Ibra has gone, can't wait to see how he does. He and Ander have quite the partnership already, hope he comes out to dominate the league this season. Having a full pre season will do him the world of good. He and Herrera have more than enough between them, on paper, to be the best central midfield in the league. Expecting big things this season. I expect the world from him this season. He has it all and now has a good understanding of his spot in the club. This will be fun to watch. Lukaku will make Pogba look better. Zlatan missed a lot of great chances that Pogba created for him. Lukaku will not only convert more, but his pace and running in behind will generate more. Pogba will get 10+ assists next season if he just continues as normal. Its his finishing he needs to work on. If other players or (new signing), score and take the pressure off, Pogba will score with less pressure on his shoulders. Fully believe the 2nd season will see him soar now that he's got his footing. Convert some of those woodwork shots into goals, be more assertive in the big matches and then just continue on doing what he was doing last season. Mourinho looks like he wants to build around him now, and that will be his making. I just love watching him. Forget helping us win games for a moment and just appreciate how nice it is to be able to see those flicks, tricks and passes for 90 minutes every week. That's also a big part of what being a football fan is all about. If our finishing improves then his statistics will be amazing. That goes for himself, too. He got into so many goal scoring positions only to miss, had so many cracking long range efforts only to hit the woodwork, and created so many chances only for others to miss. Can't wait to see him walking out at Old Trafford on Champions League match day, He will boss the midfield. I hope he's squashed his beef with all goalposts and crossbars. If there's one thing I'm looking for with him, it's consistency. He's had outstanding performances for us, the level he reached in his good to very good games was fine, but he's had too many average to poor games. One thing that really stood out to me is that he actually became really consistent after Ibrahimovic was out with his injury. I don't think those two were the greatest fit together, as Pogba is somebody who loves to push the ball up the pitch, engage in quick one-twos and find a fast way into the opponent's box, whereas Ibrahimovic, for all his qualities, can slow the game down in that regard. Either way, I'm glad to have him at the club, his quality his obvious and he's a very positive, upbeat guy, which is always good for the locker room. Expecting a much better season, especially if we're going to switch to a 3 in midfield. Our best and most important player. Hope he starts the season in beast mode.. Very good player and a great personality. Yup, he can boss the midfield, in a midfield of two. Need to prove it more in EPL though. Sheer class today. As he so often does, he made this game look completely effortless. A couple of his passes today (one in particular) defied description. 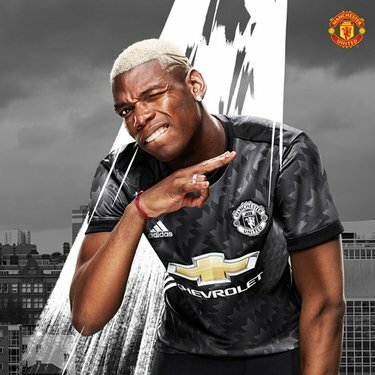 Of all our players, I'm most confident we'll see a far more productive season from Pogba this year. How did he see this pass? His vision and awareness of his teammates movement on the pitch are insane. He played the pass without even taking time to see TFM moving. He knew exactly where TFM and played the pass in such a way. I think that pass was a fluke and he actually meant to play in Martial. Don't think so. He made the same pass to Valenica multiple times last season. The weight on the pass indicates it was for TFM, not Martial. Martial would have a very hard time controlling that ball with so much pace. I don't think it was meant for his feet, it was meant to be played in front of him to run on to imo. Wouldn't have to control it if that was the case as he'd probably be in for a first time shot. Absolute no chance for inside player to chase that ball. Clearly a ball for wide player to attack the space. Makes the game look so easy. Fans certainly got their money's worth of of his performance, lots of tricks and entertainment. What an important player he's going to be this season.